After Apple announced the iPad, Barnes & Noble contacted me immediately to inform me that my long-standing Nook order was on its way. This new-to-me product has proven to be more than a little quirky—directly upon opening it. OK, I won't complain about those quirks much. I just want to point out something so ridiculous that it encapsulates every obvious and avoidable design flaw with the Nook; it should serve as a symbol, a mascot, if you will, for all that is wrong with what should be a device every bit as natural to use as a book. 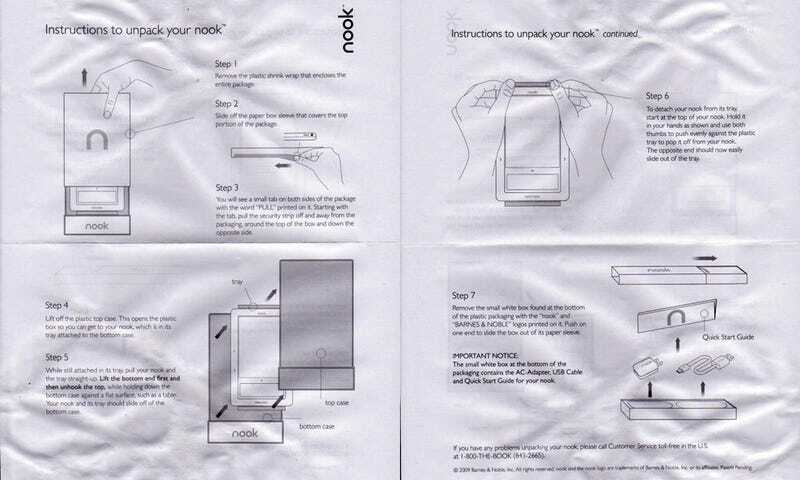 The Nook has a 2-page, 7-step set of instructions to explain how you pull the thing from its plastic case. I'm not exaggerating. Within the scope of the grandma test, it's fail incarnate. In other words, the Nook packaging actually necessitates these lengthy instructions, as ridiculous as they are in their own right. Somehow, Barnes & Noble invented a box that's every bit as complicated as their product. Mighty rulers of B&N—CEOs with names I'm too lazy to Google at this time—don't let some prima donna designer or marketer tell you how to make or package your product. Ask your mom or grandma. They always knows best. Read our full Nook review here.